October 4, 2016 (Nashville, TN) – BlackLine Advisory Group, led by financial technology veterans Pat Moran, Howard Herndon and Joshua Rosenblatt, announces the addition of Courtney Rogers as advisor. Rogers has extensive experience in financial matters, including bonds, loans and distressed lending. 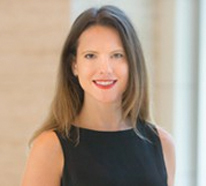 She has worked as a corporate bankruptcy restructuring and litigation attorney for a New York City law firm, handled due diligence and litigation e-discovery matters, and served as a distressed debt and special situations analyst at a large international bank. “Courtney will play an important role in serving our clients, who span all sectors of the financial technology industry – from investors, merchant acquirers and independent sales organizations, to banks, payment networks, nonprofits and governmental institutions,” says BlackLine Advisory Group President Howard Herndon. Rogers is a native Nashvillian and attended Belmont University. She earned a J.D. with a concentration in transactions at the University of Tennessee College of Law and completed clerkships for Judges H. Bruce Guyton and C. Clifford Shirley of the U.S. District Court for the Eastern District of Tennessee. BlackLine Advisory Group is a consulting firm with the industry’s most holistic set of skills under one roof, delivering strategic and legal insights for every aspect of the financial technology industry. Comprised of experienced professionals and licensed attorneys, the firm helps clients navigate the complex and ever-changing financial technology landscape. To learn more, visit www.blacklineadvisorygroup.com.